The greatest view and the quietest environment you can imagine! 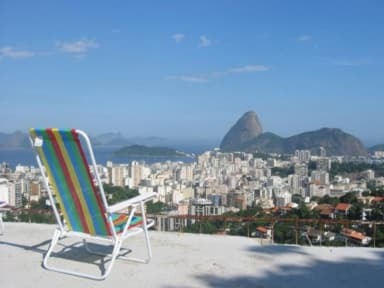 The Hostel 'Pousada Favelinha' is located on a small mountain in the heart of Rio de Janeiro, between the district of Laranjeiras and the hip Santa Teresa. It is situated inside a small 'Favela', one of the many 'poor' districts that Rio has got. However, it is not 'poor' in cultural terms, and it is absolutely secure! This is the first and original Favela Hostel in all of Brazil! Since 2004! This is the first project of its kind and one of the best opportunities to experience the tranquil life in a favela. All of the approximately 3000 inhabitants of the favela will great you in a very friendly way, and you will find lots of friends among other backpackers as well as among the people who live near our hostel. Still, you are only a five minute walk from either the metro station at 'Largo do Machado' which will take you to the Copacabana beach in only another 7 minutes, or from the 'bondinho', the old little cable car which runs through the beautiful artists district in Santa Teresa and right down to the center of Rio and the nightlife district 'Lapa'. Check out our video on the hostelworld site, and related videos on youtube to see the environment! The favela is secured by police and by the proper inhabitants. It has been absolutely quiet for the past 15 years, and many special programs guarantee it to stay this way. If you are looking for something very special during your stay in Rio, come to the Hostel Favelinha and experience Rio de Janeiro the way only very few foreigners ever see it! The German owner Holger together with the Finnish tourguide Matti and the friendly Brazilian staff around Solange heartily welcome you to the place where dreams come true!